Facebook will soon roll out an “Add Interests” menu option that allows its users to subscribe to content feeds by subject area, the company said on Thursday. “Interests feature public figures and Pages related to a particular topic, and are put together by people like you,” Facebook said in a post on its website. It’s doing some advance curating to get the feature off the ground. It highlighted a list called “2012 U.S. Presidential Candidates” run by Facebook employee Adam Conner and another called “NFL Teams” administrated by Facebook staffer Nick Grudin. 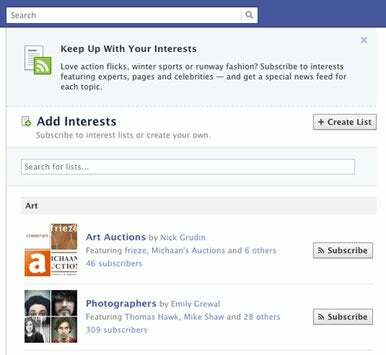 Facebook users can join existing lists like those or create their own by adding whichever people or Pages fit the topic. Items in the list then show up in their news feed. Facebook said it turns the service into a “personalized newspaper,” with lists representing different sections of the paper. Users can expect to see the feature appear on the left side of their Facebook landing page within the next few weeks, but the functionality is already live at https://www.facebook.com/addlist. The move steps up Facebook’s rivalry with Twitter, which has a similar Lists feature of its own. Lists on Twitter allow people to organize their contacts into groups, so they can view a Twitter stream for a particular topic, event or group of people.